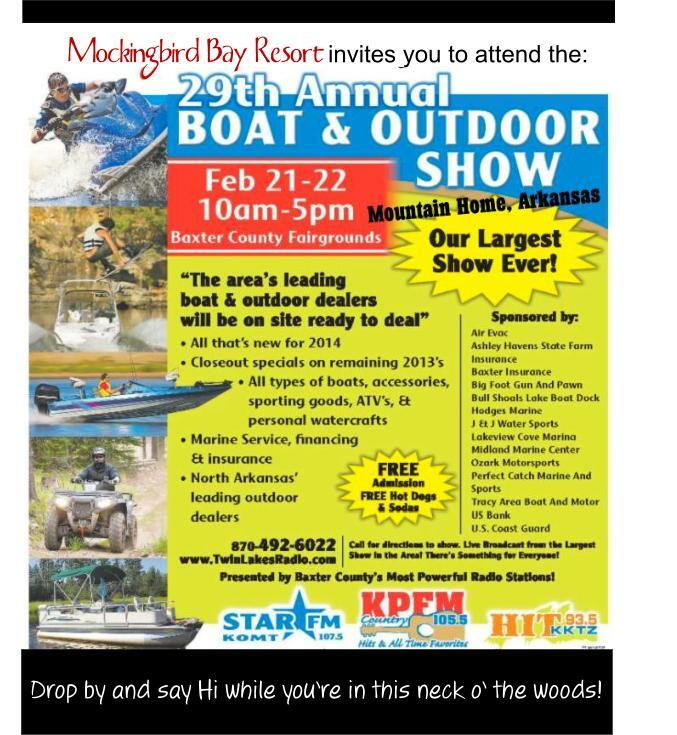 Mockingbird Bay Resort invites you to attend the Twin Lakes Radio Boat and Outdoor Show in Mountain Home, Arkansas. Bass boats, pontoon boats, ski boats, personal watercraft and more can be seen starting today at the 29th annual Twin Lakes Radio Boat and Outdoor Show at the Baxter County Fairgrounds. This entry was posted on Friday, February 21st, 2014 at 3:33 pm and is filed under Fishing, Resort Guests, Uncategorized, Zortman Family Happenings. You can follow any responses to this entry through the RSS 2.0 feed. You can leave a response, or trackback from your own site.